This 90 minute workshop is loads of fun and the perfect introduction to performing hand and rod (Muppet) style puppetry! Using professionally made puppets, participants get to learn, explore and practice the fundamentals of puppetry for live performance!” Derek Lux is puppeteer, singer, actor and award winning puppet builder. He’s designed and built puppets for television, music videos, short films, and theater. He created the curriculum and taught courses on Professional Puppet Building at Puppet School in Los Angeles. Derek received the Los Angeles Stage Alliance 2013 Ovation Honor Award for his work in Shrek The Musical. 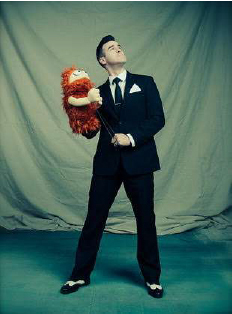 In 2016, he played the title role in a reimagined workshop of Sweeney Todd at the famous O’Neill Theatre Center in Connecticut as part of the National Puppetry Conference. Derek performs Professor Wonderman in its Gratitude videos for Class Dojo, an educational app that is used by over 8 million teachers across the country. As a full time working actor, Derek currently can be seen onstage in the principle cast of Steve Silver’s Beach Blanket Babylon, the longest running musical revue in history. For DLUX Puppets’ Alice in Wonderland, Derek built the puppets, wrote, directed and performs in the show.